Rose Tico. Is she the most hated character in the Star Wars galaxy? Perhaps. The most divisive? One could argue that. The most unwanted when it comes to toys based on her likeness? Most definitely. Anyone who's walked into any toy isle in the last 9 months has been greeted with rows and rows of nothing but Rose Tico when entering The Last Jedi section. Some outright blame her for the fall of Toys R Us. Though we like to think General Hux helped a little too, because if there is ever another figure left on the shelves alongside Rose, it's always, without a doubt, that dude. Now one man has come to the rescue. And it's pretty hilarious. At least until it gets disturbing. We once wrongly referred to Ethan Van Sciver as a Rose Tico 'enthusiast'. The man felt this was an attack on him personally. He's not a Rose Tico enthusiast. Nor is a he a fan of the character. We're not sure how to describe his relationship with the maintenance worker. He definitely sees her as a blight on the franchise, and that she's infected the canon as a whole. It's hard not to believe he's a bit obsessed with her. And that's one of the funnest aspects of his ComicArtistPro Secrets Youtube channel, which continues to build in popularity as the weeks grow on towards the release of Solo: A Star Wars Story. Van Sciver is a noted comic book artist who has done some excellent work for DC Comics over the years. And he once used his channel to help others learn and understand the professionalism behind the craft. After The Last Jedi came out, he began to make more and more videos about Star Wars and the turn the franchise has taken towards the dark side. He loves to shake a fist at 'trash' sites like ours, though he sustains off reading the words printed on such trash sites, making, I would assume, money off of them. And he's really no better off then the dozen or so sites spouting the same Star Wars 'shill lies and rhetoric'. He especially likes to taunt our site for using the word non-binary. Though, his stinging, often hilarious commentary is all quite fun and entertaining, and what makes it a worthwhile watch. He's like Jenny Nicolson in that he's become an ever-growing important voice in the Star Wars fan community that feels somewhat disheartened by what the franchise has become. And however much he wants to rally against the fact, he's jumped into this tapestry to become a small thread in the fandom that has become more exciting than some of the movies themselves lately. Which brings us to his latest video. Which takes a disturbing turn. It's clearly the workings of a mad man. Someone who has gone off the rails a little bit. It's a modern day Lava lamp. A Yuletide Log for a disenfranchise generation of Star Wars fans still trying to come to terms with their true feelings on the Kathleen Kennedy era. Like a patron saint, Ethan Van Sciver has taken it upon himself to go from store to store, collected unwanted Rose Tico toys. These pieces of plastic that sit permanently hanging from that hook, waving in your face like an agenda that many didn't want. Now, he's made the ultimate video for everyone to witness in horror. It's almost like watching Pieces for the first time. Titled 'I Hour of NonStop ROSE TICO Unboxings', Ethan rips and tears into each toy, taking out the action figures with different methods. It gets extremely disturbing as he takes sharp instruments of terror, and proceeds to stab and cut and whittle into these poor, unassuming toys. Perhaps the most disturbing piece of video sees the man wielding a pair of scissors, as he cuts through Rose. He cuts her head, multiple times, and its a scene right out of a horror movie. It's something you can't unsee. And it's downright hilarious. Yes, the commentary is understood. It's burning satire, and a deep felt expression for not just him but a lot of Star Wars fans. Maybe you agree to disagree with him and others, and how they feel about The Last Jedi and what is currently going on with the Star Wars franchise. Many truly love The Last Jedi and think its a great movie. We're not here to argue that one way or the other. 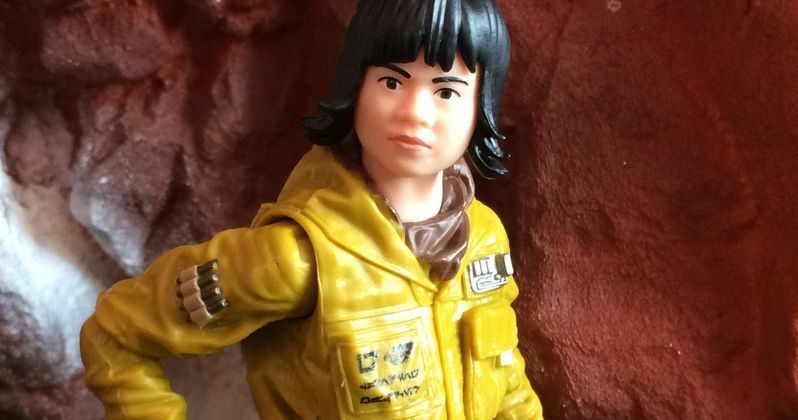 But this is one video you can watch and wonder why exactly do they keep making so many Rose Tico toys? And what's going to happen to them all? Are they going to wind up in that landfill next to all those E.T. Atari cartridges? Check out the madness at ComicsArtistPro Secrets.